so spread the word.....is it an easy map? Another great map by you cairns, I really enjoy your maps! Suzy1 wrote: Another great map by you cairns, I really enjoy your maps! cairnswk wrote: XML has been fixed and uploaded. i wonder how many he's up to now??? Oh and PM me with your secrets of success please. I'm 33-4 now (all foggy 1v1s). Due to the smaller number of starting territories and the difficulty of getting at some of the bonuses, it is much harder winning from second than it is on Waterloo. In particular I am not a fan of thew Free French at all, and think that any single territory bonuses should start neutral. Most the games are won with the +4 for The Cauldron. You'll be pleased to know that I did win one game from behind by pulling off both Rommel and Panzerarmee on the same turn (remember the fog). 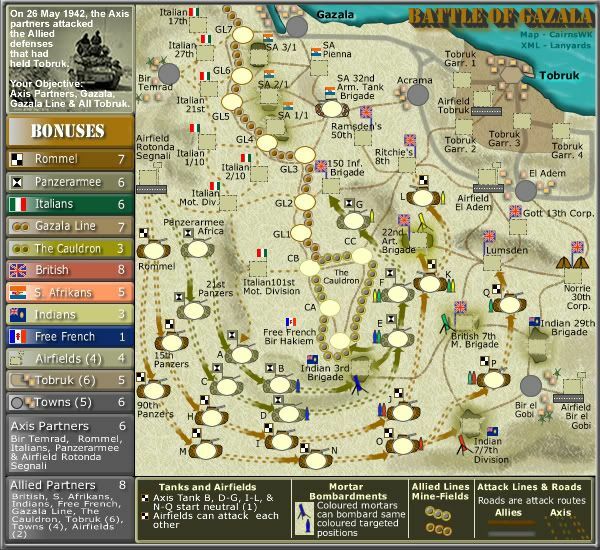 It is not an easy map at all, but mainly because there are a number of different things going on - one-way, bombardments etc. Obv this is only based on 1v1 fog, we shall have to wait to see what standard games are like. on the tanks E, & P there are cyan coloured mortar shells but i can't find the cyan mortar to attack those two sites from. can someone give me directions ? Last edited by greenoaks on Thu Apr 17, 2008 4:21 am, edited 1 time in total. greenoaks wrote: on the tanks p & q there are cyan coloured mortar shells but i can't find the cyan mortars to attack those two sites from. can someone give me directions ? The mortar just to the left of those 2 tanks. thanks yeti but that is a green mortar. i want the cyan one. in Game 2198944 at tank P Cyan has 2 armies which is the same colour as the shell at P. the colour of that shell matches the one at E, not the ones at F or K.
i also think tank Q is a Cyan coloured shell. I do agree tho - the mortar itself seems to be a slightly different colour to the shells... you'll have to wait til Cairns comes back to explain why!! if you look at Game 2198055 at tank E, cyan has two armies on it, which is the same colour as one of the shells at E.
There is no correlation between the army colours and the shell/mortar colours, which i guess is what you;re examining here. actually there is no difference...they are both #35D786, i believe the colour difference is originating from the combination of neighbouring colours next door to these two shells. All of these shells are #35D786, forget trying to match these colours with the army colour as they are not the same. It is the mortar at British 7th M. Brigade that is a different colour being #00CC66 which i don't see as begin a problem since it is so close to the shells colours anyway, but will upload a correction image for both l&s maps. no, its the same as it's siblings. bug, if you want to call one poofteenth of a difference a problem. since the xml is correct, then i see no issue. if you'd be so kind to upload. i wasn't trying to cause trouble cairns. i have spent the last 2 days trying to find the corresponding mortar, running my finger methodically up and down that map to cover every inch of it, squinting, leaning up close to the screen & then doing all that again on the next map. i just could not work out how i was missing it every single time. i have noticed that colour on every map i have played regardless of what colour army is beside it, including the neutral question marks. the 2 games i provided links to were to show yeti they looked cyan not green like the mortar or the shells at F or K.
i am currently in or have completed 14, while awaiting players in another 9 because this is currently my favourite map. great map, well done. greenoaks wrote: i wasn't trying to cause trouble cairns. i have spent the last 2 days trying to find the corresponding mortar, running my finger methodically up and down that map to cover every inch of it, squinting, leaning up close to the screen & then doing all that again on the next map. i just could not work out how i was missing it every single time. If you struggle to see the connections that much - you need BOB in your life! greenoaks wrote: i wasn't trying to cause trouble cairns. I don't beleive you were trying to cause trouble either, just wanting clarification on you saw as an issue. This is why it is very important, and i know ytou are already participating, that as many people as possible give feedback to maps to ensure they go live correct. i have spent the last 2 days trying to find the corresponding mortar, running my finger methodically up and down that map to cover every inch of it, squinting, leaning up close to the screen & then doing all that again on the next map. i just could not work out how i was missing it every single time. Do you not use BOB, or take notice of what the xml drop lists tell you? I have not read through the 20 or so pages so forgive me if this was addressed earlier. Having recently become aware of the objectives in this map I thought I'd try for them. Further down the Axis Partners are listed as Bir Tedheim, Rommell, Panzeramee and Airfield Rotunda Segnali. So in Game 2714537 I held all these objectives at the start of Round 12. When I didn't win I decided to take a look at Bob and determine why not. According to Bob, in addition to the things listed I also have to hold all 6 90th Panzers, all 6 15th Panzers, all 7 Italian regiments, and all 8 21st Panzers. Now I can see that I missed the Italians when looking at the Axis partners but the problem as I see it is that this map will almost never win as an objective map. I had thought it an interesting twist to try out but you have to hold 45 of the 65 terts to complete the objective which seems to make the whole thing somewhat pointless as an objective. I guess my main issue though is that I think the objectives themselves are unclear. I can see that when you stated Rommell in the objectives you were referring to those that required the Rommell bonus yet I read it as Rommell itself and the same for Panzanerree. Is there a possible way to clear up that confusion or is it just not worth the effort? Now you appreciate that real estate is a at a premium on a map because of the size, so grouping by association is in the legend is quite obvious. This was gone over in some detailed effort in the development. As far as the objective goes, this was a Real Life battle and that is what was won, so no changes there either. Well of course it may be just me having issues. I tend to be rather stupid at times but I suppose I wonder if nobody has had an issue because nobody has attempted to win by taking the objectives. I ask out of ignorance of course but is it possible to see how often the game is won by having the objectives met. barterer2002 wrote: Well of course it may be just me having issues. I tend to be rather stupid at times but I suppose I wonder if nobody has had an issue because nobody has attempted to win by taking the objectives. I ask out of ignorance of course but is it possible to see how often the game is won by having the objectives met. i know what you mean barterer2002. i won all my games by killing off people, but then that is what CC allows for in that game. That's why Das Schloss is truly the very first "objective only game". i know it is possible to list all the completed games, but then i imagine you'd have to troll through them all to see who won by objective. Airfield Rotonda Segnali looks like it connects straight away with 21st Panzers. Only when i tried to attack did i find out that it actually goes through Panzerarmee Africa. The route line for this one looks very misleading(shows that it is going from the airfield to 21st). Can it be changed please? Shrinky wrote: Airfield Rotonda Segnali looks like it connects straight away with 21st Panzers. Only when i tried to attack did i find out that it actually goes through Panzerarmee Africa. The route line for this one looks very misleading(shows that it is going from the airfield to 21st). Shrinky...thanks for comment. I will put it on the to do list if there are any other comments to the same extent. considering that the line actually goes through the Panzer Africa tank, I think this one is more of a brain fart than a misleading / unclear attack line. edbeard wrote: considering that the line actually goes through the Panzer Africa tank, I think this one is more of a brain fart than a misleading / unclear attack line. nope. if u look closely on the left side, u will see that the line is a continuous one and does not cross panzer africa at all.